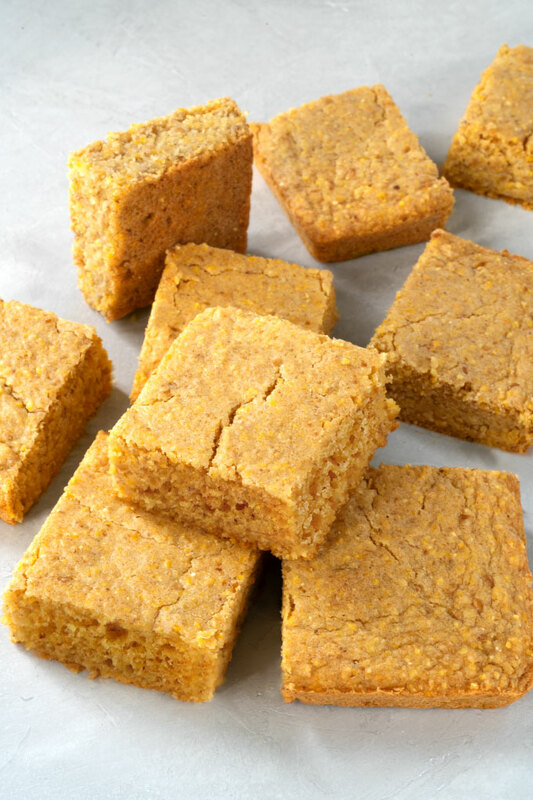 This vegan and gluten-free cornbread has the perfect ratio of cornmeal to flour. It’s not too coarse-grained, but it still has the corn taste. It’s moist, tender, buttery, and only slightly sweet. It pairs perfectly with chili or stews. Cornbread is considered a staple in many homes and everyone has an opinion on it. Is it sweet or is it savory? Do you add honey or molasses? Should you mix in actual corn kernels or leave them out? And what about flour? Can you use anything other than cornmeal? Like any other dish made in several regions, the way you grew up eating it is the way you think it should be made. But the differences between Northern and Southern cornbread are dramatic. 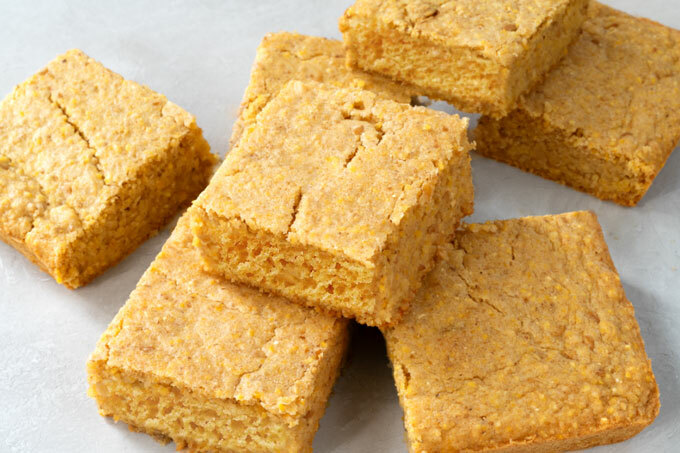 Southern cornbread is made with cornmeal only (no wheat), has very little or no sugar, and is cooked in a hot skillet on top of the stove and finished in the oven. Northern cornbread has a much higher percentage of flour, is very sweet, and baked in the oven. Which do you prefer? 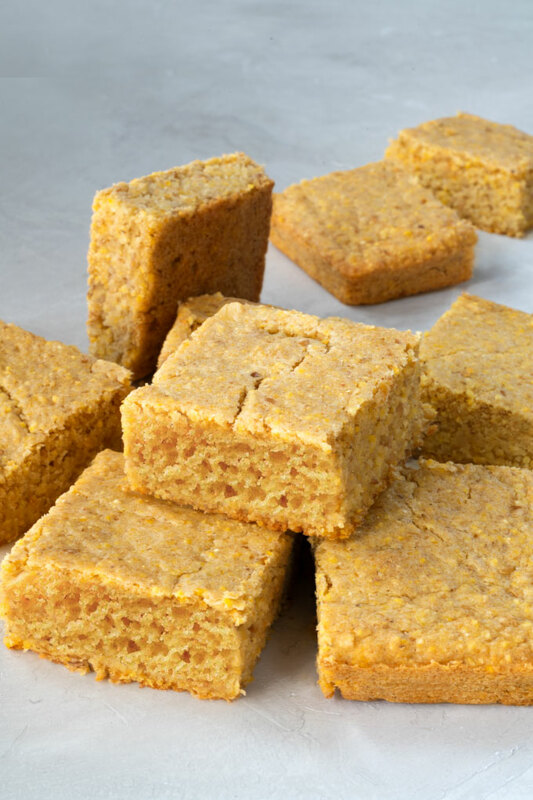 Sweet cake-like northern cornbread or savory dense southern cornbread? What if you could have a little bit of both in one recipe? This cornbread recipe delivers exactly that – it’s slightly sweet, tender, and moist with a delicate crumb. It wouldn’t be cornbread without cornmeal. If you’ve never heard of cornmeal, it’s essentially ground, dried corn. It may be white, yellow, or blue. It also varies by the grind – fine, medium, and coarse. The finer the grind, the lighter the texture, but also less apparent corn flavor. You may also see cornmeal labeled stone-ground. This is whole-grain cornmeal that’s been milled by traditional rather than modern methods. Modern, high-speed mills heat up the grain, deteriorating the taste and quality of the oily germ. So, for a more true corn flavor, look for stone-ground cornmeal. I use flour in my cornbread to lighten the texture. I have tested several different flours and find that oat flour works the best here because it also acts as a binder. Another binder in this recipe is flax seed meal. The combination of medium-grind cornmeal, oat flour, and flaxseed meal yields cornbread that is crumbly only slightly, which is the texture I prefer. If you prefer coarser and crumblier texture, increase the ratio of cornmeal to oat flour. Corn is stubbornly resistant to rising agents. Breads made from it will always be denser and heavier than yeast-raised wheat varieties. But that’s not to say you can’t make a bit of a difference with a little baking powder and baking soda. Vegan buttermilk (almond milk + lemon juice) and vegan butter are my go-to liquid ingredients. I have tested this recipe with refined coconut oil, and it works. However, you won’t get the buttery flavor and beautiful yellow color if you substitute the vegan butter for refined coconut oil. So, what about sugar? I used a little bit of coconut sugar because I find that it enhances the natural sweetness of the corn. However, you don’t have to use any sugar if you don’t want to. The best cornbread is the cornbread you like, no matter where you live. You can cook your cornbread in a square pan, a cast-iron skillet, or even a 12-cup muffin pan. My favorite is a cast iron surface because it provides the best heat retention. Greasing your pan before adding the batter is a must. And if you want a crisp brown crust, which is the true mark of good southern cornbread, make sure you preheat the pan before adding the batter as well. This cornbread is the perfect side dish for any chili, stew, or thick soup. It's slightly sweet, soft, and moist with a delicate crumb. Pour the milk into a medium mixing bowl, add the lemon juice, and give it a few stirs. Let it sit for 5 minutes. Add the corn meal, oat flour, baking powder, baking soda, and salt into a large mixing bowl. Stir until well combined. Add all the other ingredients into the mixing bowl and mix until just combined. Grease an 8" x 8" (20 cm x 20 cm) baking dish****. Pour the batter in and bake the cornbread at 350°F (175°C) for 25 minutes (until a toothpick inserted in the middle comes out with a few moist crumbs but no wet batter). Let the cornbread cool in the pan for at least 30 minutes. Then remove to a wire rack to cool completely. Store leftover cornbread in an airtight container for 3 days. For longer term storage, freeze in an airtight container for up to 3 months. *Make sure your milk is at a room temperature, so the vegan butter (or coconut oil) doesn't harden once added. **2 Tbsp. (14 g) flaxseed meal + 5 Tbsp. (75 ml) water. Whisk and let the mixture sit for 10 minutes. Then use as instructed. ***I make my own oat flour by grinding rolled oats in a Vitamix. A cup of rolled oats will yield approximately 1 cup of oat flour. ****You can also use a 9" (22.5 cm) cast iron pan, a 12-cup muffin pan, or two 10-oz (0.3 l) cast iron servers. Thank you Rajaa! So happy you loved the recipe ❤️ I really appreciate all your feedback! Is it possible to use polenta instead of cornmeal? Hmm, I have never tried it. Polenta is coarser than cornmeal, so the cornbread might not turn out as soft (it will be grainier and crunchier) but it should still work. Alternatively, you could grind the polenta into a finer texture. Can I substitute the almond milk for coconut or soy milk instead? Yes, you can use any plant-based milk. Just be careful with coconut milk – you will be able to taste the coconut-y flavor in the cornbread. If you do decide to use coconut milk, don’t use canned full-fat coconut milk because the consistency is too thick. Let me know if you have any other questions, Abbie. You never skip a beat, this recipe is head on. My husband loved it and so dud I. Thanks! So happy to hear that you and your husband enjoyed it, Nadine! Thank you so much for taking the time to share your feedback ❤️ I really appreciate it. I made this today and it’s very good except I used coconut oil instead of vegan butter and it has a dull light brown unappetizing color. I skimmed through the written blog before I made it and missed the part where you did mention that. I don’t like the ingredients in vegan butter, but I would use vegan butter next time if I was planning to serve it to guests. Thanks this was very yummy, I used tahini +pumpkin butter instead and bit of date paste instead of sugar and it worked just fine. Just had to add splash more milk. Thank you again for sharing your recipes. Love your YouTube channel. I made this cornbread today. I was worried when I saw the batter was looking quite runny but it came out nice and moist. We enjoyed it with chilli for dinner. Thanks for the recipe! Very tasty but mine crumbles a lot. I don’t know what I did wrong…do you have any idea what might have happened? Hi Sandy – what grind of cornmeal did you use? And what brand? I find that medium grind works the best but even then, the type of grind varies among brands. If your cornbread was too crumbly, I would slightly reduce the amount of cornmeal and increase the amount of oat flour (start by using 1 1/3 cup oat flour and 2/3 cup cornmeal). Oat flour is much more binding than cornmeal, so that should definitely help.